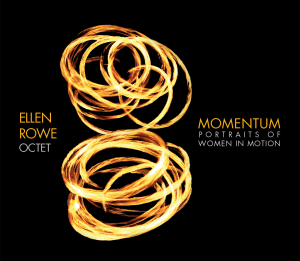 There are two ways a listener might understand Ellen Rowe’s ambitious new album, Momentum, Portraits Of Women In Motion. One would be to consider the concept, in which Rowe pays tribute to great women of politics, music and sports, and the fact that she does so by assembling a stellar cast to play these pieces. An alternate approach would be to sidestep the album’s social content and simply focus on the music, particularly the deftly voiced horn charts Rowe has written, and the soulful, Horace Silver-style groove she pulls from the ensemble. Rowe has recruited a high-calibre crew here: In addition to Miller, Mayhew and Jensen, she has Tia Fuller on alto saxophone, Lisa Parrott on baritone, and the astonishing Melissa Gardner on trombone. As for the listener, the experience is certainly life-enhancing. Between the writing and the playing, tracks like the deeply swinging “The Soul Keepers” (a tribute to Geri Allen by way of Mary Lou Williams) and “Ain’t I A Woman” (a civil-rights tribute that’s equal parts gospel and hard-bop) are as good as mainstream jazz gets these days.